This page describes various international money transfer services and how they could be used. MoneyGram could be used as alternative payment method. MoneyGram is a United States-based financial services company, with international offices in 190 countries. MoneyGram usually charges you around 10-20 € for money transfers depending on the service fee, sales agent or country. Visit MoneyGram webpage to learn how this system works. Step 1: Find a MoneyGram agent using MoneyGram website. Step 2: Visit your MoneyGram agent, taking a personal identification document* with you. Step 3: Complete a simple ‘send’ form and hand this to the MoneyGram agent along with the money you want to send and the transfer fee†. Indicate your email address or userid ( you need to be logged-in to view your userid ). Step 4: You will be given a reference number. Step 5: Go to nominate page and click the design you want to nominate. Step 6: There is a link under this page, next to the nomination button it says: "By default, payments are made by "Credit Card". If you need to pay with other methods (such as Bank Transfer, Electronic Money, Paypal, etc) click here instead." click on this link (this is a dynamic link that changes with each design). Step 7: A new page "Payment with other methods" will appear, choose Award Category and continue by pressing "CONTINUE PAYMENT" button. Step 8. 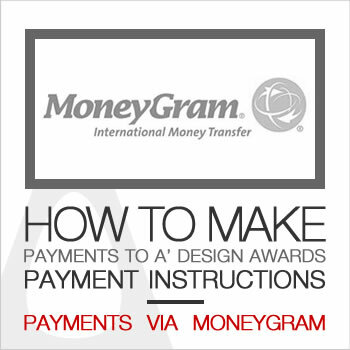 In this page, from the "Payment Method" menu choose MoneyGram. Step 9. Enter the reference number (which you got it in step 4) to AUTH/REFERENCE CODE field and press "CONTINUE PAYMENT" and we will manually confirm the payment. * You may be required to provide personal identification, usually one or more of the following: passport, driving license, national identity card or a government issued identification. You may also be required to provide proof of address (bank statement or utility bill). Requirements vary by country so please ask your local MoneyGram agent for acceptable identification formats. † In addition to the transfer fees applicable to a transaction, a currency exchange rate set by MoneyGram or its agents may be applied. Prices subject to change. **Subject to the receiving MoneyGram agent’s availability and hours of operation, and local regulations and operating hours of A'Design Award. Western Union could be used as alternative payment method. Western Union is a United States-based financial services company, with international offices in 190 countries. Western Union usually charges you around 10-20 € for money transfers depending on the service fee, sales agent or country. Visit Western Union webpage to learn how this system works. Step 1: Visit a nearby Western Union® Agent location. Step 2: Fill out the required form. Then, simply show the Agent clerk your identification card. Step 4: Your receipt will have the MTCN (Money Transfer Control Number) that will allow you to track the status of your money transfer online. Step 8. 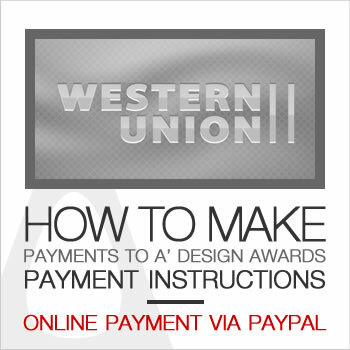 In this page, from the "Payment Method" menu choose WesternUnion. Step 9. Enter the MTCN (Money Transfer Control Number) (which you got it in step 4) to AUTH/REFERENCE CODE field and press "CONTINUE PAYMENT" and we will manually confirm the payment.